If you’re curious how the Apple Watch’s heart rate monitor works, the company is now happy to explain. A new support document on Apple’s website describes exactly how the watch measures your pulse, how often the readings happen, and what factors might affect the readings for better or worse. Similar to many other wearable fitness trackers, the Apple Watch relies on green LED lights for a method called photoplethysmography (or PPG). Because blood absorbs green light, and each pulse brings a spike in blood flow, determining heart rate is a matter of measuring the changes in green light absorption. 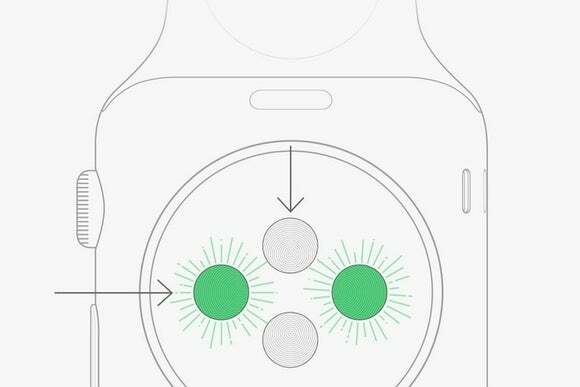 During workouts, the Apple Watch does this by flashing green light onto your wrist hundreds of times per second, then measuring light absorption with photodiodes. When you aren’t working out, the Apple Watch uses a slightly different method. Just as blood absorbs green light, it also reflects red light, so every 10 minutes the Apple Watch’s infrared LEDs kick on to measure heart rate. Apple still uses its green LEDs as a fallback when the infrared readings aren’t adequate. Studies have shown that green LEDs are more accurate for PPG, so why doesn’t the Apple Watch just use them all the time? Apple doesn’t say, but it could be a battery-saving measure. Presumably, pinpoint accuracy isn’t as important when the Watch is just trying to figure out if you’ve been inert for too long. In any case, wrist-worn heart rate monitors aren’t foolproof, and Apple admits it may have problems measuring heart rate in some situations. Cold weather, for instance, could make it hard for the sensor to get a reading, as could irregular movements such as tennis or boxing. Apple also suggests a “snug but comfortable” fit for the wrist strap so the sensors stay in place. The Apple Watch starts shipping on April 24, though new orders are backordered until June. Why this matters: Too often, tech companies slap heart rate monitoring into their smartwatches as if only to tick off a feature box. There’s not much regard for accuracy, and few details on how the technology works. While Apple may not be immune to some technical difficulties, it’s at least providing users with plenty of information, including a realistic sense of how well the sensor will work.